It’s February, and the highlight of the month for many people is Valentine’s Day. There are differing accounts of who Valentinus was and what he did to generate this celebration named after him, but I think the most credible one is that he was the only son of a chocolatier/florist/greeting card manufacturer whose father commissioned him to do something noteworthy to drum up business. Stop and think of the one human being whom you love more than anyone else on earth. What would you do for him/her? What do you do for him/her? Is it always what you “feel” like doing, as in, “YES-S-S! I get to empty our awesome dishwasher!”? But hold it—could you “feel” like emptying the awesome dishwasher? Of course, if you chose to feel that way. And how could you do that? You could focus on your priceless wife, and how blessed she is when you do that—and put the stupid little garlic crushing thing in the right drawer. Now think about how that relates to Jesus Christ going through everything he did for you, a sinner he had never met. Oh, wait, he was God, and he had absolute foreknowledge, so he knew how wonderful you would be and how easy it would be to gleefully die for you. No, he laid down his life for you because he loved his Father and wanted to glorify Him. Jesus interacted with the whole spectrum of humanity, from the worst Pharisee to the best disciple, so he did experience some wonderful people. But primarily, our Savior did what he did because he made up his mind to make God’s promises come true. A word unknown to writers outside of the N.T. Philanthropia was the highest word used by the Greeks, but it meant only giving to him who was entitled to it his full rights. 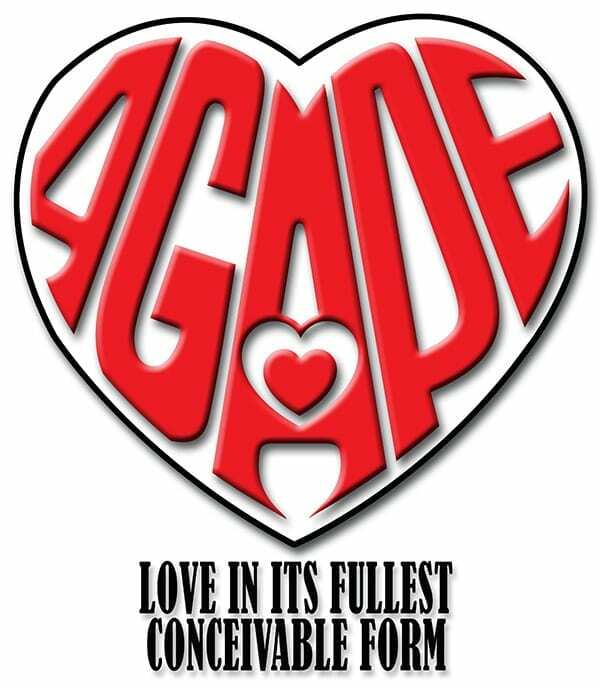 Agape denotes the love that springs from admiration and veneration, and chooses its object with decision of will, and devotes a self-denying and compassionate devotion to it. Love in its fullest conceivable form. Both our heavenly Father and our Lord Jesus have modeled this kind of love for us. Each so loved that he gave his most precious possession. Grasping the reality of this love is the key to loving our God and our Lord, and to fearlessly loving one another. The way you and I “lay down our lives” for one another is to subjugate our desires and do what is in the best interests of the other. Simple: when I allow fear to stop me from loving as the Word says I can, it is because I am not in touch with how much Jesus loves me—and has my back. I don’t love others because I don’t get how much he loves me. The first step to remedy that is to get my head in the Word and the Word in my heart. The next step is ask the Lord Jesus to help me see how much he loves me. And the next step is to do what he asks me to do so that he can prove his love to me. Never forget that you are a member of the Body of Christ. His life pulsates within you, and your life pulsates within him. You really do have his power, and you really can do the works that he did. He longs for you to include him in every aspect of your life so that he can show you how he always trusted God when he was tempted in all ways like you and I are. Now think about this pithy truth: True love communicates. Yes, true love communicates horizontally to the one beloved (don’t forget your Valentine’s Day card), both in word and deed, but true love also communicates vertically to God and the Lord Jesus on behalf of the beloved. 19 Pray also for me, that whenever I speak, words may be given me so that I will fearlessly make known the mystery [secret] of the gospel, 20 for which I am an ambassador in chains. Pray that I may declare it fearlessly, as I should. If I care, I’ll be in prayer. If you are married, praying for your spouse is not optional. Remember that marriage is the ultimate “Laboratory of Love.” As we learn to love our spouse, we can perfect the art of loving others. As someone trenchantly observed, “Marriage is your last, best chance to grow up.” Amen. In closing, I want to put in a plug for our fabulous 24-hour video presentation, One Day With The Creator. If you do not have it, you need it. Anyone you know who does not have it needs it. Do you remember how “turned on” you felt when you first heard the Word of God? Why not give others that opportunity? Who do you know that doesn’t know? ODWTC is the best tool on the earth to build a practical knowledge of the Word into people—and to build a local fellowship. Really, what else is there to do in this life?